This article is about the original M808. For other uses, see Scorpion (disambiguation). The M808C, the most common iteration of the M808 MBT. The M808 Main Battle Tank, commonly known as the Scorpion, is the United Nations Space Command's mainline armored mobile weapons platform. The tank was originally manufactured by Chalybs Defense Solutions, until Acheron Security took claim following the Human-Covenant War and the destruction of numerous CDS facilities on Meridian. The Scorpion has remained in service for centuries due to its combination of affordability, simplicity, and versatility and its rugged, adaptable design, features that cannot be matched by any "superior" main battle tank design. Additionally, the Scorpion's functional uses are numerous and widely varied—although the UNSC predominantly uses the tank for direct engagements, local defense, and anti-armor operations. A result of the tank's effectiveness and practicality, the M808 Scorpion has become the UNSC's template for all modern main battle tank designs. The M808 has proven itself to be the workhorse of UNSC armored attack vehicles. The tank's 90mm cannon can deliver a devastating blow to all targets—infantry or armor. The M808's thick ceramic-titanium armor can withstand a direct hit from a Covenant fuel rod cannon and survive with enough armor to keep fighting. The Scorpion's one-man crew severely limits human casualties; along with its main offensive capabilities, one other man can man the tank's turret as a gunner, and four infantrymen can sit on the tread pods of the tank, providing supporting fire while using the tank as a transport. The M808 Scorpion is the UNSC's lead armored vehicle, having served for over three centuries. Its four-track nacelles design, with each track mounted on an independent computer-controlled suspension system, allows the M808 Scorpion to traverse, climb over, or maneuver around large debris or other battlefield obstacles, and prevents the vehicle from being easily disabled. 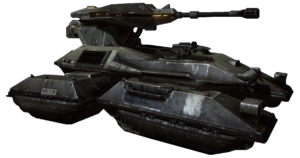 The Scorpion is not the most powerful or quickest UNSC main battle tank, but it is often considered to be the best marriage between those two qualities. The M808 Scorpion is equipped with a two-tier weapon system. The tank's primary armament is the M512 smooth-bore high-velocity cannon, a gun capable of firing 90mm tungsten shells and canister rounds with a three-to-four-second interval between each firing session. The M850 Grizzly is the only human tank capable of outgunning a Scorpion. The machine gun is either co-axial or pintle-mounted. The variants of the M808 Scorpion have varying armaments, in both cannon and machine gun type. The M808 Scorpion has more than a half-dozen variants over its many years of service, each with minor adjustments depending on its role. The physiological aspect and versatility of the main battle tank remains unchanged with each variant. M808B Scorpion – An older variant with a coaxial M231 machine gun. M808C Scorpion - The "mainline" iteration of the M808 during the Human-Covenant War, features an M512 90mm smoothbore cannon for anti-tank and anti-fortification use, and a pintle-mounted M247T 7.62mm medium machine gun. M808S Scorpion - A variant used by the UNSC Spirit of Fire during the Second Ark Conflict. The M808 Scorpion was first manufactured in 2218, rumbling across the sands of Mars and over the rubble of urban battlezones on Earth. Modern examples of the Scorpion tanks only bear a passing resemblance to the earliest models. During the Insurrection, rebels would utilize stolen Scorpions against the UNSC.